Recently my husband and I celebrated our 10th wedding anniversary “sans kids” in beautiful Devon for a few days. Facing a four-hour drive, we were secretly looking forward to a quiet and relaxing road trip, maybe a sneaky nap en route, catching up on reading, listening to the radio, chatting and just watching the beautiful scenery pass by. Bliss. Fast forward four weeks to our annual family escapade to the deepest parts of Cornwall and we were faced with a longer and quite different car journey. We now had the kids, aged 5 and 7 in tow. One hour in the car with our children is usually the limit before we are bombarded with a constant chant of “Are we there yet?” or “Mum, I’m booooooorrrreeeed”, irritating bickering or even worse the incessant request for food…”I’m huuuunnnnngggry”. And, I just cannot listen to the soundtrack of Moana any more, wonderful as it is…! 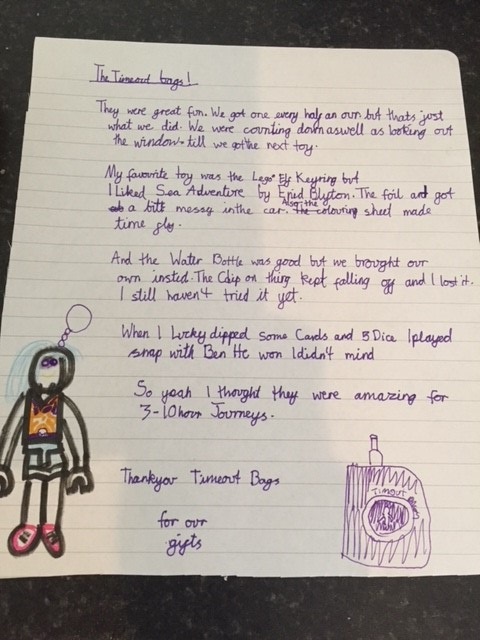 Refusing to succumb to offering the kids screen-time in the form of a tablet to get through the journey, I had a better idea… I had seen online a company advertised called “Timeout Bags”, who provide activity bags for children and have been nominated for two prestigious awards in 2018. I was intrigued – could this be the answer? Founded earlier this year by Alix Porter, a Mum of two, Timeout Bags offer ready-made activity bags for children of varying ages for long journeys, hospital visits and wedding functions as a healthy, educational and productive alternative to screen time. 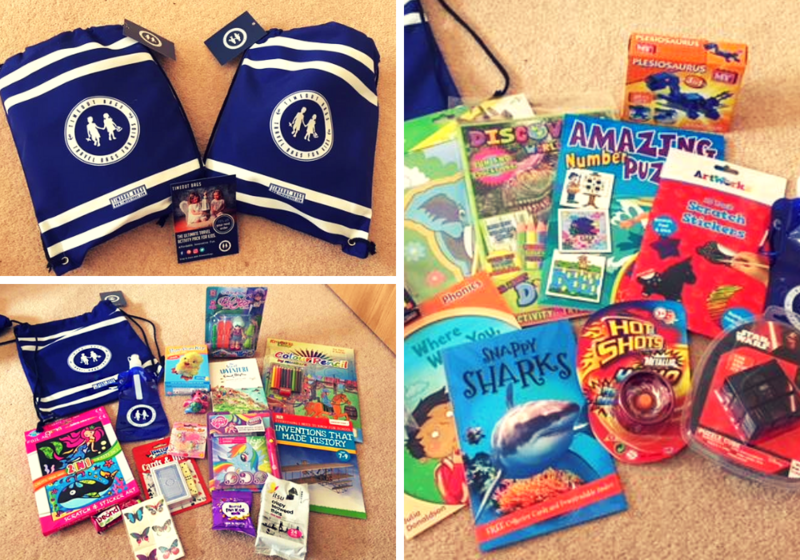 Included in each bespoke activity pack are ten activities, based on a hand-picked selection of educational books, fun games, age-relevant toys and three healthy snacks. Beautifully packaged and contained in an eco-friendly re-useable cotton drawstring bag, each bag contains everything you need to keep the kids entertained, stimulated and happy when they (you?) need it most. With bags catering for different genders and age ranges, each is bespoke for your child’s age group and arrives beautifully packaged and labelled for each child. A portion of each bag sold is also donated to UK based charity Changing Faces, which helps disfigured children and adults. So, we put the bags to the test! Would they keep our fabulous duo entertained for four hours? The resounding answer is YES!!! First, a prehistoric dinosaur for Ben to make out of bricks and for Isabella a doll with skates to assemble – so far so good! Then a colour by numbers book for Isabella and a Star Wars Rubik cube for Ben, followed by a wonderful Enid Blyton book and a Dinosaur Discovery book, a foil art set and some magnetic snakes and ladders. 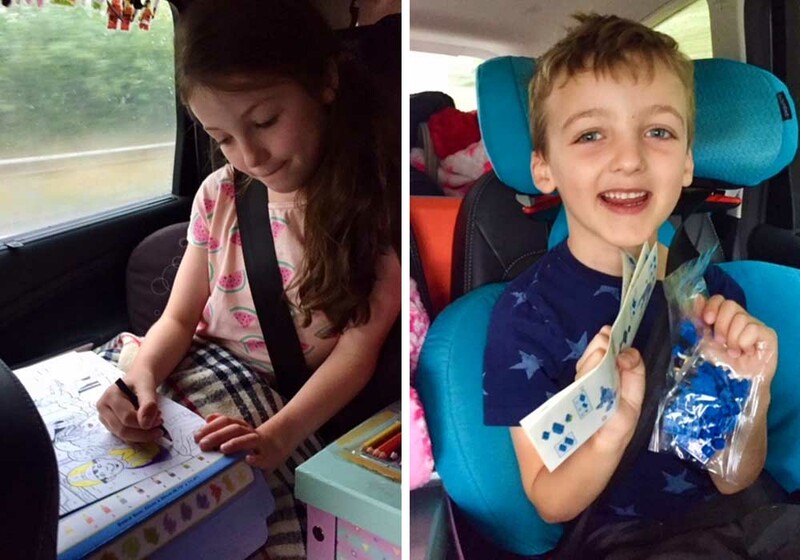 A quick pit stop for lunch and back to the activities….My Little Pony Invisible Ink, Scratch Sticker art, Pom Pom animals, modelling clay, cards, dice, learning about famous inventions and filling in puzzles and games. A little snack here and there and before we knew it, we were at our destination! No fighting, no arguing over who has what (I even heard sharing…..who knew? ), no resorting to the overplayed Moana CD or tablets – just the kids counting down the minutes until the next activity was pulled from the bag! Wonderful. As a Mum, I was really genuinely impressed with the quality of the items in the bags and with the sheer thought that had gone into every single thing in there. It was clear that the bags offer fantastic value for money, there was just no way I could have popped all these bits together for the price of a bag or have had the foresight to have thought of all the different activities too. The bag is retailed at £22 which for 10 items and 3 snacks is incredible value at just £1.69 each, not forgetting the bag and the reusable water bottle too! All items were spot on in terms of their age groups, and the children were so engaged with each item. The educational value of the products was also apparent, with various books and activities supporting the KS1 learning programmes and it was a joy to find an Enid Blyton classic I hadn’t even read in there too, one we are now enjoying together. Timeout Bags are a fantastic concept. The kids didn’t ask for the tablets once on holiday, all the activities were in the holiday cottage with us and were played with daily and better still, there were still more things to unwrap…..more for the way home! Timeout Bags, we will be back in touch to order more bags in December. Travelling with my sister and four kids under the age of 8 non-stop to New Zealand for Christmas, we are going to be in desperate need of your inspiration and help. I have a sneaky feeling you are going to make this journey feel half as long and for that, I thank you wholeheartedly in advance! This is a sponsored post by Timeout Bags. The review is written by LittleBird’s Alex and the content entirely reflects her genuine thoughts as a Mum-of-two. If you want to try a Timeout Bag for yourself, you can save yourself 10% by entering the code LITTLEBIRD into the discount field at the checkout. 1. To redeem your discount, simply enter the code ‘LITTLEBIRD’ into the discount field at checkout. 2. The promotion is valid until 18th October 2018. 3. The 10% discount is applicable towards the purchase of Timeout Bags only, and does not apply to shipping or re-shipping charges, which are extra. 4. Mama’s survival kits, Wedding Activity Packs and Gift Vouchers are excluded from this promotion and are not eligible for the 10% discount. 5. This promotion may not be combined with any other discount or offer. 6. This promotion is non-transferrable and may not be redeemed for cash or replaced if lost or stolen. 7. Timeoutbags reserves the right to change these Terms and Conditions and to withdraw this offer without prior notice. 8. Should there be any disputes, Timeoutbags decision is final.